“Luiz Vilela’s love of art is so contagious that even the most jaded cynic would mostly likely see things in a different light. There is nothing timid in his style and in his dashing use of color!” — Cathie Viksjo, Hunterdon County Town & Country Living magazine. Born in Brazil, Luiz Vilela was raised on his family’s coffee plantation where he developed his love of imagery and all forms of artistic expression. This led him to pursue a degree in Architecture and Urbanism at Federal University of Rio de Janeiro. While in college he began his graphics design career working for advertising agencies and designing sets for the theater. A career in book illustration followed. Wishing to broaden his artistic education he moved to New York City where he received a degree in illustration from Pratt Institute and subsequently joined the art department of Random House Publishing. 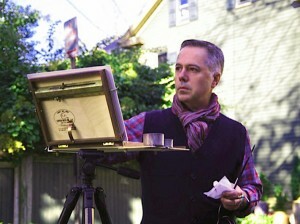 At Pratt, he studied painting with Brooklyn artist Meri Bourgard, among others. He also attended the Art Students League where he practiced with Ronald N. Sherr. Luiz has studied with artists Nelson Shanks, David Leffel, Sherrie McGraw, Daniel Sprick, Jeremy Lipking, Kenn Backhaus and Robert Liberace, among others. His artwork has been displayed locally and internationally and has won several awards including several “Best of Show”. Luiz’s painting “The Phillip’s Mill” was selected by the Art Committee to be featured in all publicity and advertising for the Annual Art Exhibition at The Phillips’ Mill in September 2013. Recently his works have been awarded in the First Annual International Juried Artists Guild Exhibition at the Legacy Gallery in Scottsdale, Arizona; at the Salmagundi Club in New York; and in the celebrated 2013/2014 (ARC) Art Renewal Center Salon. Vilela’s work is featured in the database of James A. Michener Art Museum, in Bucks County, and it is included in the permanent collection of Museum of Contemporary Art (MAC) Bahia, Brazil. Luiz has had several solo shows over the last decade and has been included in some of the area’s most prestigious shows. “My goal is to reproduce what I see with my eyes, but also what I feel with my heart. To do that, I must think, imagine, compose and create my truth in a way that makes the art achieve an atmosphere and enchantment that will be universally appreciated,” says the artist, who lives in Lambertville, New Jersey, where he has his studio. Luiz likes to contribute to the Shad Poster Festival, an event that happens every year in April, in Lambertville, NJ. The shadfest (shad fest, shad festival) art scholarship fund poster auction benefits local young artists. Luiz has been participating since 2002 and every year he has won awards with his posters in the competition, including four Best in Show Awards, and several Best Humorous Awards.